The Great Barrier Reef offers World class diving sites with superb coral and a great marine life. Depending on your time, your budget, and your diving certification you can dive in many places around Cairns. If you don’t have so much time, or you are travelling on a tight budget or you want to just take diving lessons, the best is to dive on the Outer Reef which is about 60km from Cairns. You will go there on a day trip or during a short liveaboard. Here you can spot turtles, Whitetip Reef Sharks, dolphins and all the superb Reef fishes. For underwater photographers, there are also plenty of critters. The most popular spots are Flynn Reef with many turtles and nice coral, and Milln Reef with its teeming marine life. You can only access the best of the Great Barrier Reef by Liveaboard cruises. I usually use this website to book in advance my Liveaboards in Australia as they usually have the lowest rates I find. I like it because they have an easy booking system and you can book a cabin and pay later. The most popular spots are the great Ribbon Reef and the magnificent Osprey Reef! Due to the remoteness, diving here is more suited for experienced divers. The main attractions are the superb coral formations, the big fish action with lots of pelagic hunting around and the many species of Sharks you can encounter! During the right season it is not rare to spot a Humpback Whale, a Minke Whale as well as dolphins. Dugongs are a possible encounter too. Watch this great video to see how it looks like underwater! 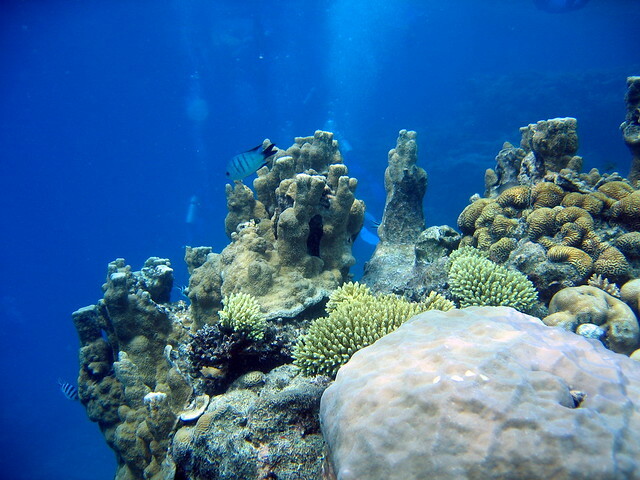 In this page you will find more detailed information about scuba diving in Cairns. How to dive Cairns ? The main (and best!) part of the Great Barrier Reef is located quite far away from the mainland and is not reachable on a day trip. If you want to be able to dive on the Ribbon Reef you need to take at least a short liveaboard for 3 or 4 days. The most wellknown spot is called Cod Hole where you can get very close to friendly Giant Potato groupers! It is a truly magnificent spot for underwater photography. If you want to dive the remote and excellent Osprey Reef you need to take a liveaboard for at least one week. The best spot is called North Horn, and is famous for its resident population of Sharks. Dive operators often include shark feeding where you have the chance of spotting Whitetip Reef Sharks, Silvertip Sharks or the rare Tiger Shark! Cairns is the main gateway to the Great Barrier Reef and most of the Liveaboards start from there. When diving in Cairns you will go for day trips to the Outer Barrier Reef which is the closest part of the Great Barrier Reef from the mainland. Diving the Outer reef is very good but not as amazing as the further Ribbon Reef and Osprey Reef (coral sea). 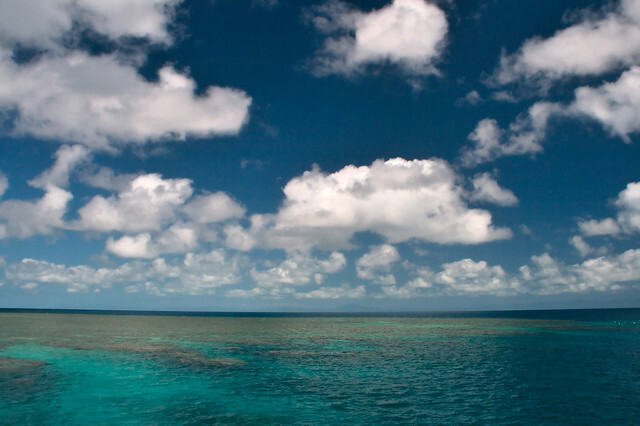 The Outer Reef is located about 60 km from Cairns. It features easy and relaxing dive sites perfect to learn scuba diving. From Cairns you can also dive the Inner Barrier Reef on day tours but diving is not as good as on the Great Barrier Reef and visibility is generally not so good. So it is best to explore a bit further, it will be worth it! I usually use this website to book in advance my hotels in Cairns as they usually have the lowest rates I find. I like it because it's free to cancel and change the dates. Cairns offers very good diving conditions all year round. The wet season runs from November to March with usually heavy rain early in the morning or late afternoon. Dry season with sunny weather runs from May to September. The visibility is very good all year round but the best visibility is generally in June and from September to November. The Minke Whales season runs from June to August. The humpback whales season is from June to November. The best scuba diving season on the Great Barrier Reef runs from mid-August to mid-December with excellent conditions. The climate is tropical and with hot and humid weather year round. The air temperature is about 30°C. Cairns is the place with the highest number of beginner divers getting their Padi Open Water certification! The number two destination is Ko Tao in Thailand. People generally come to Cairns to take a scuba diving course because it is cheap and it is close to the Great Barrier Reef. In fact, a dive course generally includes a short Liveaboard on the Great Barrier Reef! You should be aware that before starting your course, you will need to get a medical certificate. If need be, you could find a doctor in Cairns who will be able to do so very quickly for you. Most of the courses start in a swimming pool then finish on the reef for 3 days of diving. To get your Padi Open Water you need at least four days, so plan your trip to have enough time! There are numerous dive centers in Cairns and not all of them offer the same service and quality. The best is to visit several dive shops and ask questions and sign up with the one you feel the most comfortable with. Conditions are good year round around Cairns. The water temperature on the Great Barrier Reef usually ranges from 24°C to 29°C and from 25°C to 30°C on the local dive sites. The current is generally gentle around Cairns but can be fierce if you go on the Ribbon and Osprey Reef. The visibility on the local dive sites is not excellent and ranges from 5 to 20 meters. However if you take a Liveaboard dive trip you can expect very good to excellent visibility up to 40 meters. The depth ranges from 5 to 30 meters but most of the dive sites are suitable for beginner divers and don’t go below 20 meters deep. Cairns offers great snorkelling opportunities. You will find a lot of dive centers offering snorkelling day tours on the Great Barrier Reef. However, you will have to snorkel in a dedicated marked area. If possible try to take a tour on a small boat instead of the bigger boats if you don’t want to spot more snorkellers than fishes! Like the divers you will need to pay a “reef tax” of $20.00 per person in addition to the tour price. When Snorkelling on the Great Barrier Reef, don’t forget your sunscreen and a T-shirt to protect from sunburn! The Australian rays can be harsh. If you are planning an upcoming dive trip or travelling to Cairns, it is a really good idea to invest in travel insurance for scuba diving, because you never know what could happen and when you might need it (because accidents do happen!). I recommend this diving insurance as they offer worldwide coverage and focus on providing scuba divers a quality insurance and medical assistance service. Now that you know all about the underwater world, you might want to start planning your scuba holiday! Check out our Cairns Travel Review for information about how to get there, activities and excursions, where to stay, and more. I haven’t so far but this is definitely in my “To Do” list. Recently one of my colleague along with her BF has been there and she loved it. And the way she explained her trip to the Great Barrier Reef, I guess it’s worth seeing & experiencing. We did a liveaboard (3 days, 2 nights) with Cairns Dive Center (CDC). I do NOT recommend them! Both of their boats, the daytrip boat Sunkist, and the liveaboard boat Kangaroo Explorer, are falling apart. The air conditioning broke both nights (and it gets really hot in the cabins without it), there is rust everywhere, and cracks/damage all over the boat. We went to only 3 dive sites on a 10-dive trip. That’s less than 25% of the dive sites they claimed we might visit. We never made it to Milln Reef, even though CDC has dive sites there that we could have visited. Conditions were fine for moving the boat – I blame the stinginess of the owners and laziness as the reasons why we did not get to see more reef locations. To sum up: the owners do not care about the quality of your experience with CDC – they are out to make a buck. No money is being spent on keeping the boat in good shape; it never returns to harbor, and it is falling apart. The diving was mediocre at best. I will be at CAIRNS 2 days or perhaps 3 , 22th from 23th of Novermber. My level is 2 PADI. What do you propose for diving ? and prices ? Great info! I just wanted to know do you also arrange diving in Cairns? 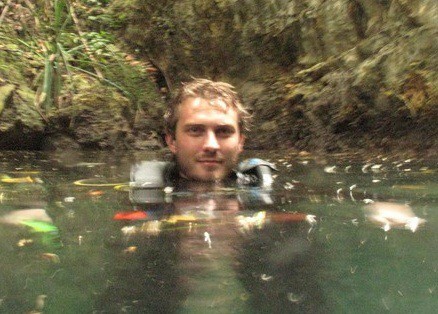 or can you suggest a good but economical diving instructor there? me and my husband are there in the second week of Feb 2016. Og nÃ¥ spammer jeg kortenmamfeltet ditt litt: Jeg synes egg i wot’en er helt nydelig og en vesentlig del av retten. I tillegg er wot godt med helt vanlig grovbrÃ¸d til og sÃ¥nn spiste jeg det i Ã¥resvis til jeg opparbeidet meg smaken for injera. Have you been diving or snorkelling in Cairns? Consider sharing your experience with the diving community by leaving a comment below! Excellent Place for scuba diving courses and to get your Padi Open Water. Main gateway to the Great Barrier Reef and Liveaboard starting point. Looking for practical information for a trip to Cairns? Check out our Cairns Travel Review! Check out these few spots around Cairns!